The Child is a card of new beginnings. It’s about starting over, and having something new entering your life. If new things are entering your life, surrounding cards will indicate what those items may be, e.g., a new job, a new house, etc. The Child card represents all aspects of a child’s nature – playfulness, innocence, a carefree attitude, and immaturity. People represented by this card are either young or look younger than their age. They can even be an actual child, including the querent’s child. The Lenormand Child Meaning in Love: A new love or a fresh start in the querent’s love life is usually indicated. The Lenormand Child Meaning for Career: The Child card can refer to a new job, a new career, short-term (temporary or seasonal) work, or a career involving education. 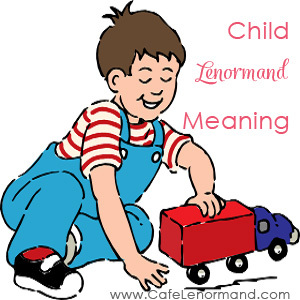 The Lenormand Child Meaning in Health: Traditionally, the Lenormand Child card refers to childhood illnesses, such as the measles or chicken pox. Using the Child for Timing: The Child is a positive card for timing. It indicates something will happen fairly soon. You can use the number 13 if you need to be more precise, using surrounding cards to determine if days, weeks, or months are involved. If the Lily or Mountain are present, they can delay the speed of the Child card to just over a year (roughly 13 months). Where do you need to make a fresh start in your life? What areas in your life would benefit by you having more fun? Would taking a more mature approach help you achieve your goals? Are you willing to let go of the past and make a new beginning? I’m not sure what you mean as your last sentence appears to have been cut off. Are you looking to purchase Lenormand cards? You might want to read this article: Best Beginner Lenormand Deck It contains information on decks and where to purchase them.